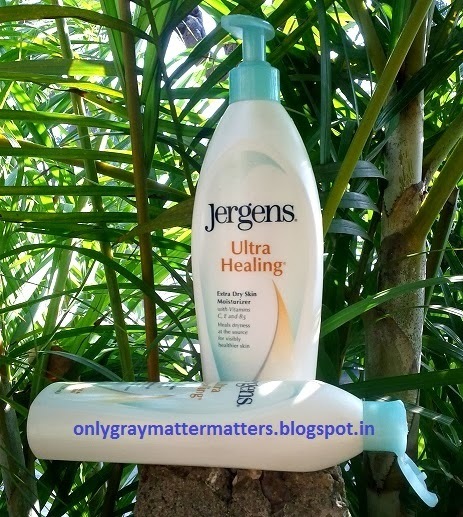 I am sharing the review of Jergens Ultra Healing Extra Dry Skin Moisturizer. 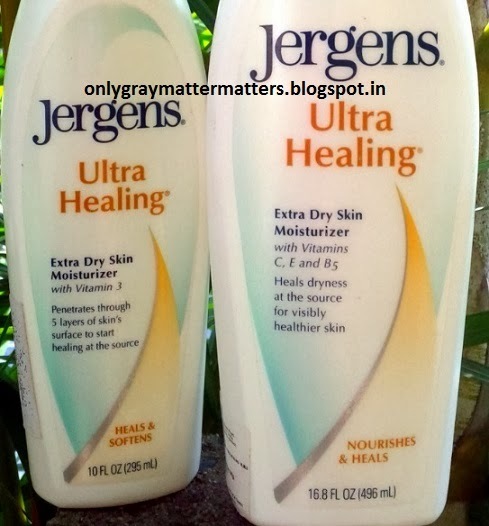 While Jergens offers many moisturizers/ body lotions formulated for different skin types and different needs, this extra dry skin moisturizer is especially formulated for very dry, thirsty, under-nourished skin that needs special protection and treatment from several layers deep within the skin. If you suffer from excessive dryness, cuts and cold sores in winters like me, Jergens Ultra Healing extra Dry skin moisturizer is for you. 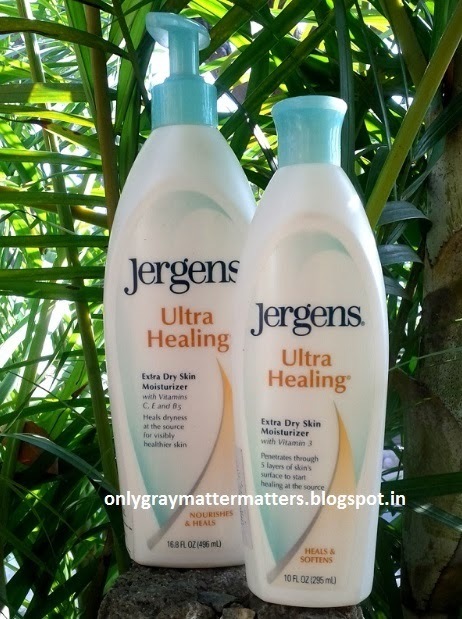 Jergens Ultra Healing Extra Dry Skin Moisturizer penetrates below the surface of extra dry skin, making it look quenched and moisturized. It contains an enriching blend of Vitamins C, E and B5 that heals dryness at the source and locks in moisture for 24 hours for healthy looking, nourished skin, helping you look and feel more beautiful. 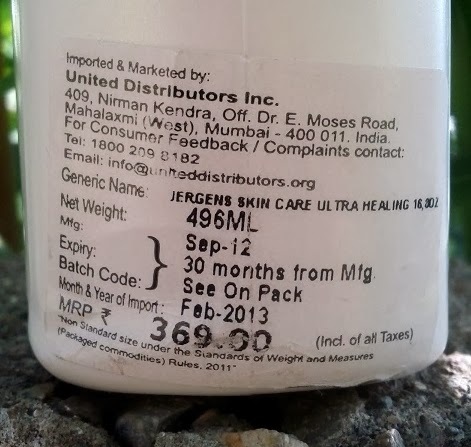 Availability: You can buy from amazon.in, flipkart.com (295 ml, 496ml and 621ml new packing), snapdeal.com, shopping.rediff.com, ebay.in, fragume.in etc. Jergens products are also available in certain stores in major cities. Jergens body lotions/ moisturizers are really raved about in the US. The smaller (295 ml) bottle is a travel size pack with flip-open cap. The 496 ml and 621 ml packs are big pump bottles for home-use and are too bulky to carry while travelling. Most body lotions contain similar ingredients. But unlike other body lotions in the market, this one does not contain those chemicals which are dangerous to be used on broken or damaged skin. The ingredients are far better than other body lotions in the market. It has 2 parabens as preservative. Most body lotions contains more preservatives than that. It also contains mineral oil like other body lotions. Now, I have used Soulflower's body milk and Biotique's nyctanthes hand cream which are both all natural, but both failed me in winters. When I use the Biotique hand cream along with this lotion, it works superb for me (a tip shared by one of the readers). So I see that mineral oil becomes an essential ingredient in body lotions to form a barrier on the skin and to prevent it from further drying. There are several qualities of mineral oil and a brand like this would surely be using a high quality one. If you want a natural barrier on the skin, try Avocado carrier oil directly on skin or mix some drops in any body lotion while applying. 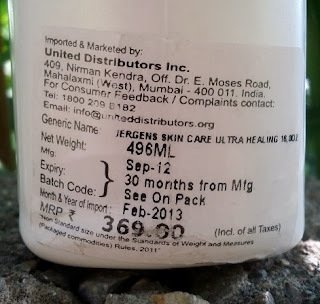 My skin goes ultra dry in winters and by mid November, I develop deep cuts in my palms. Most winters the back of my palms go purple and frozen and remain like that till March. This year I started applying this body lotion from the beginning of winters and all those horrible symptoms have vanished. This body lotion definitely does what it claims. It is meant to protect as well as heal ultra dry skin. Because it is meant for extra dry skin, it actually forms a thick barrier/layer on the skin while some of the ingredients seep in and heal the dryness from within. If you take a good amount on your palm and open and close your fist, you can hear 'pichh pichh' sounds with a plasticky feel because it is very thick, plus I think the amount of dimethicone is more. It is non-greasy and absorbs very fast, making dry skin supple and moisturized instantly. Only if you take a large amount and apply at one place, it would take longer to absorb, being thick. You don't have to rub it in. Simply spread on the skin with gentle pressure and leave and it will absorb on its own. Has a mild fragrance which is not bothersome at all. Most moisturizers wash off easily on the first contact with water leaving skin dry again. This one washes off partially and my hands remain soft even after washing. It remains there for 24 hours and mostly I apply only once a day except on my hands where I have to reapply due to frequent hand washes. All in all it is an awesome moisturizer which provides great protection and is keeping my skin healthy in this cold. I like it better than Nivea, Vaseline or any other moisturizer I have ever used. Do try this one if you have normal to very dry skin. This particular variation may be a bit heavy for oily skinned people but you can choose another variant from their range. Its good to know that it worked for you Gagan, especially to get rid of those cuts and dryness. I am liking the Dive with Shea butter one, these days. Thanks Niesha, yeah you know how it difficult winters get for my hands :) I haven't tried any lotion from Fove yet but yes I would surely love to try a shea butter lotion or body butter from any good brand. Thanks for telling me about the Dove one. Thanks Radha. I didn't know you too might need a body lotion coz you guys don't get winters, lucky eh :) I think their Aloe Vera and Cucumber one is for summers. Thanks Megha :) I too had used it many years ago and now again returned to this brand. i have used jergens hand and foot cream once and it really worked!! got to try this though.. will surely be on my next buy list :) nicely reviewed gagan! Oh, thanks so much for reminding me about the foot cream. I had bought from Delhi a few years ago and used two tubes, but I had totally forgotten about it coz I never saw it online. Now that you reminded, I am gonna look out for it coz it was very good. 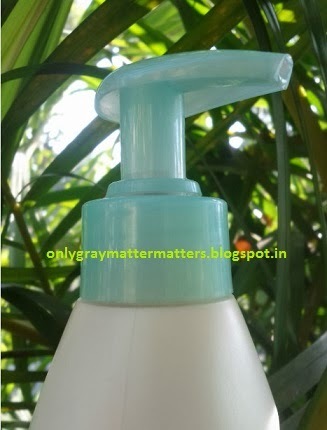 And Supriya you might not need this heavy lotion in Mumbai, so just check out the shea butter one or the Aloe vera one. They have many more in the range. everyone says so gagan.. but my super dry skin seems to beat Mumbai weather too... I used a thick lotion in winters. but yes in summers can try the aloe vera varient. Do tell me if you see this online somewhere.. Yes dear, both Shea butter and the Aloe Vera one are available at Flipkart. They sell like hot cakes so go out of stock quickly but flipkart does restock within 7-10 days. Haven't seen all these variations on any other online store. Yes Sujata, this does not feel heavy on dry skinned people even in Summers. It has really helped repair my skin. Esp my hands go dark and dry in winters but this helps repair the skin very quickly. You can get it easily online as well as in local shops in major cities.